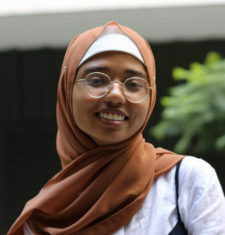 Atia Fatimah is currently completing her third year in Bachelor of Psychology at the University of New South Wales. She has a strong interest in developmental psychology, and psychopathology. She aspires to complete a Master’s degree in Clinical Psychology and endeavours to be a clinical psychologist. She is fascinated with pioneering psychological research and as a member of the Parent Child Research Clinic at UNSW she enjoys being at the forefront of developmental research and researching non-drug treatment strategies for specific demographics. In the future, Atia aspires to work with children and adolescents to destigmatise mental health issues and implement empirical, innovative methods to improve well-being.